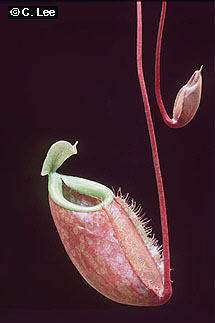 Previously known as N. globamphora, this dwarf species has tiny globose pitchers flushed orange at the tips of long tendrils. An uncommon species, it prefers warm, humid conditions to thrive. Perfect choice for growing in a terrarium! Available plants are approx. 2"-3" in diameter. Distribution: Philippines. Lowland.